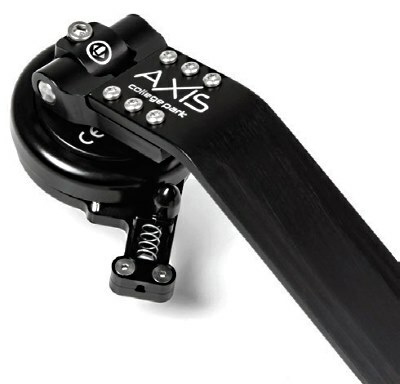 Formerly the LTI Locking Shoulder Joint, the new AXIS® has been re-engineered by College Park. With a patented friction hinge, the shoulder joint is operated with simple switches that simplify harnessing by eliminating the need for gross body movements. The AXIS can be integrated with all upper-limb control systems with a special channel to conceal and protect power cables. Unlike any product on the market, the AXIS provides better task control, a natural range of motion, and ease of use for the patient's daily life. Learn more at www.college-park.com/axis-shoulder-joint. i-limb™ quantum is the standard for myo-electric prosthetic hands and is the only upper limb prosthesis that can change grips with a simple gesture. Tidwell's Orthotics, one of the leading central fabrication facilities, is offering the Amber AFO at an incredible price of $275 with a 5-7-day turnaround. The Amber AFO is a lightweight leather gauntlet with a polypropylene inner structure that is designed to treat conditions such as PTTD, DJD, ankle trauma, arthritis, and ankle instability (not intended for use with abnormal protrusions). The new CLAW™ feature is for OWLS® WHO™ and shark-o™ orthoses. Diabetic and nondiabetic Charcot joint neuropathy presents the need for orthotic designs to accommodate, correct, unload, and/ or alter specific gait dynamics. The CLAW technology was developed to enhance the OWLS WHO and shark-o designs by improving orthotic fit and increasing patient function. Triplanar adjustments allow quick and easy alignment changes to optimize each patient's walking characteristics. The CLAW allows for progressive adjustments to accommodate these many variables, and are all performed in the patient fitting room. Learn more online. There has been a lot of buzz about 3D-printed foot orthotics, but does it create any added value or is it pure marketing? Once you start incorporating digital gait data into the digital design, 3D printing is literally adding new dimensions to custom orthotics. Leo Trayner, CPed, has more than 20 years of experience at Wright and Filippis and is one of the pioneers working with Phits™ Insoles powered by RS Print™ technology in the United States. He started working with the 3D-printed Phits orthotics in 2016 and successfully helped over 500 patients with the combination of digital gait analysis, digital design, and 3D printing. "At first, I was skeptical, so I challenged the system to the limit with extreme cases, and the bottom line was that the patient outcomes were excellent." Trayner's skepticism changed to enthusiasm: "The technique to create traditional orthotics through foam impressions or slipper castings is not exact. Data and information provided within the Phits system are scientific based and much more exact. The biggest advantages are labor and time efficiency. I can see more patients, the turnaround times are fast and reliable, and the end product is right from the first time. I can take these out of the box and let the patient walk on them. The 3D-printing technique allows me to incorporate local stiffness or stiffness direction. You simply can't achieve that with another orthotic." Healthcare professionals, for a free catalog and samples, call 800.424.5561. Foot care retailers, for referrals and free displays, call 800.356.8185. For direct patient orders and free brochures, call 800.PEDIFIX. For over 40 years the Verne Bintz Company has been serving the O&P profession by distributing the highest quality products with the highest quality service. We are proud distributors of Birkenstock, Powerstep, Spenco, Pedag, and much more. The transfemoral Socket-less Socket™ now comes in three configuration options—SwingBrim™, cX-Hybrid™, and cX™. The SwingBrim and cX-Hybrid can both be retrofit into most conventional transfemoral sockets, and each offers the same brim comfort and conformity as the full cX Socket-less Socket. Contact us for a free consultation to find out which socket configuration is right for you. View the free Socket-less Socket training at Socket-Soft.com. NSP™/CSP is a green, eco-friendly, natural fiber that creates no itch. Copycat fibers that claim no itch don't compare. NSP/CSP is a unique fiber that is lighter and stronger, and offers half the stiffness and ten times more impact resistance than carbon. The stiffness can be regulated by fiber orientation to equal carbon. NSP/CSP is dynamic in its ability to be either stiff or flexible, depending upon the practitioner's preference. NSP/CSP wets out fast because of its high resin fiber interface and low void content, which means the resin sticks and air does not get trapped easily. The new Fillauer Formula Foot is the ideal balance of flexibility and power, creating a dynamic foot design intended for a wide range of users. The long, lightweight carbon pylon provides critical energy return to the user through the posterior attachment, while the compact shape of the ankle allows for better cosmetic finishing without hindering foot performance while worn with a shoe. Everyday users to elite athletes will admire the active feel of the Formula, and practitioners will appreciate the diverse range of fitting options for their patients. The ComfortPAD™ for Ypsilon® FLOW provides a gliding "sling" between the leg and the Ypsilon FLOW wings. The reduced friction between the leg and AFO makes this pad an ideal option for sports activities such as walking, running, or bicycling. It's also an excellent option for patients who experience pressure on the tibia. The wide, thin band offers exceptional comfort with no hot spots of pressure on the back of the leg. Free ComfortPAD with every Ypsilon FLOW ordered through December 31, 2017. Contact customer service or email info@ allardusa.com.